Build a Simscape Electrical model and parameterize the blocks using datasheet values, run the model, and examine the results. 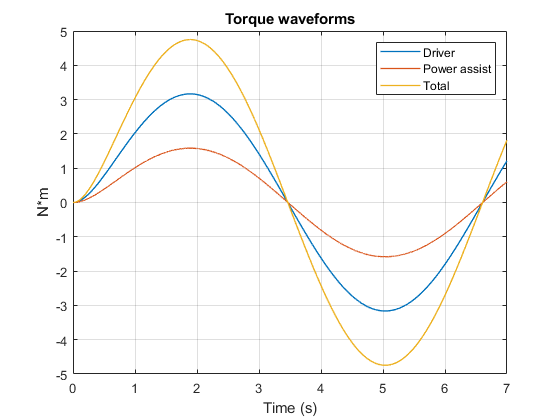 Build a model of a DC motor, modify the parameters, run the model, and examine the results. Model a three-phase AC voltage source driving a simple load using Simscape Electrical. 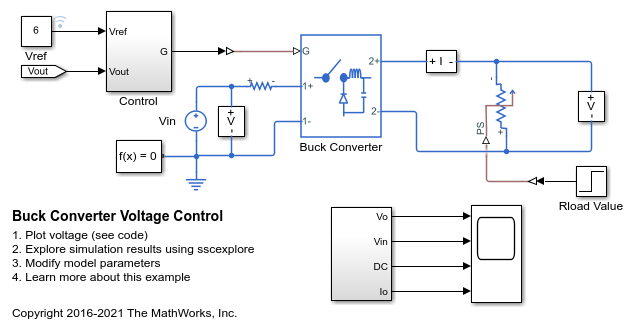 Build a simple circuit using Simscape Electrical Specialized Power Systems blocks and connect it to other Simulink blocks. Use the Powergui block to analyze static and frequency-domain response. Specify initial conditions for state variables using the Simscape Electrical Specialized Power Systems powergui block. 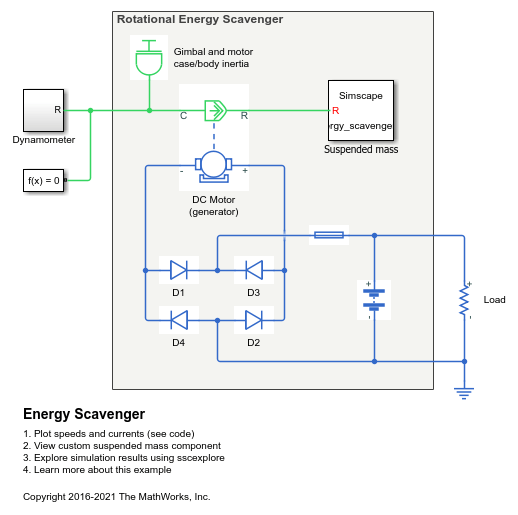 Use theSimscape Electrical block libraries to model and analyze electronics, mechatronics, and electrical power systems. Model mechatronic systems, analog circuit architectures, and single and multi-phase electrical power systems that you can connect to networks in other Simscape domains. Use the per-unit (pu) system to simplify electrical power system simulation calculations and analysis. 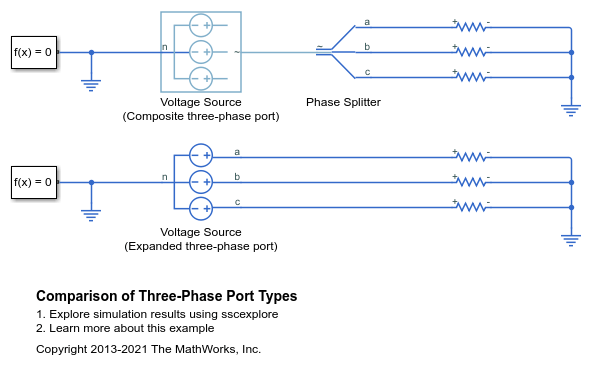 A comparison of Composite three-phase ports versus Expanded three-phase ports. The first circuit shows a Voltage Source configured with a Composite three-phase port. A Phase Splitter block provides the interface to the Simscape™ foundation library electrical elements. The second circuit shows a Voltage Source configured with an Expanded three-phase port which can connect directly to the Simscape foundation library electrical elements. The Voltage Source can be changed from Composite to Expanded three-phase ports by use of the Simscape block choices option on the right-click context menu. How to use the Controlled PWM Voltage and H-Bridge blocks to control a motor. The DC Motor block uses manufacturer datasheet parameters, which specify the motor as delivering 10W mechanical power at 2500 rpm and no-load speed as 4000 rpm when run from a 12V DC supply. Hence if the PWM reference voltage is set to its maximum value of +5V, then the motor should run at 4000 rpm. If it is set to +2.5V, then it should run at approximately 2000 rpm. The Simulation model parameter is set to Averaged for both the Controlled PWM Voltage and H-Bridge blocks, resulting in fast simulation. To validate the averaged behavior, change the Simulation mode parameter to PWM in both blocks. 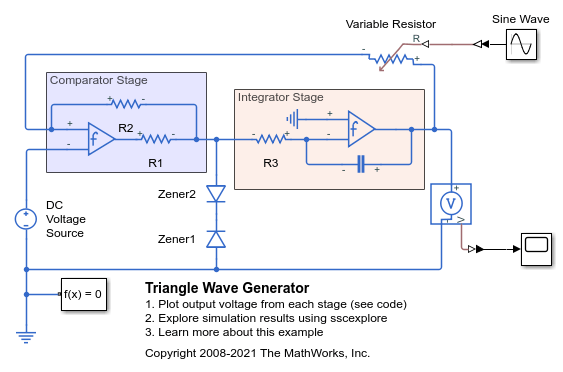 An implementation of a triangle wave generator circuit using two op-amps. The first stage of the circuit is a comparator constructed from an op-amp. The output of the comparator is limited to about plus or minus 5 volts by the two zener diodes. The limits imposed by the zener diodes result in a square wave. 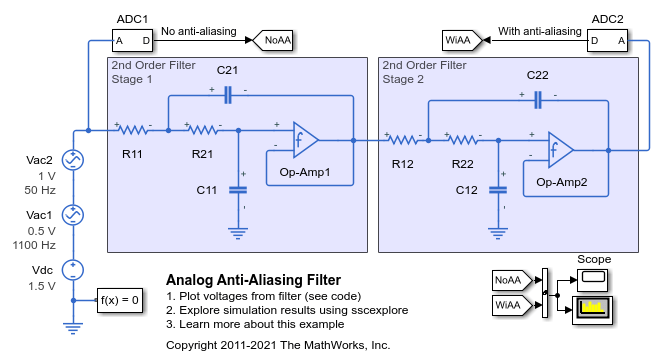 An analog implementation of an anti-aliasing filter for use with an A-to-D converter. The filter cut-off frequency is set to 500Hz in order to match the A-to-D converter sampling frequency of 1kHz. The test signal incorporates a desired 50Hz sinusoid plus a higher frequency component at 1100Hz that cannot be captured with a 1kHz A-to-D sampling frequency. The scope shows the captured signal without and with anti-aliasing. With the anti-alias filter the 50Hz sine wave amplitude is correctly measured with an amplitude of 1 and corresponding power of 0.5W, i.e., 27dBm for a 1ohm reference load. Control a four-quadrant chopper. The Control subsystem implements a simple PI-based control algorithm for controlling the output current. An average-value Chopper model is used to speed up the simulation. The simulation uses both positive and negative references. 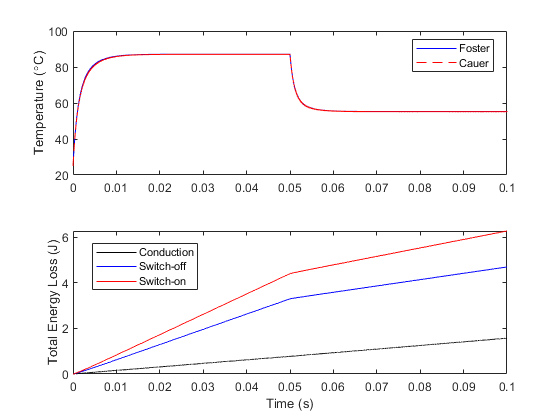 The total simulation time (t) is 1 s. At t = 0.5 s, the polarity of the load DC source E changes. Control the output voltage of a buck converter. 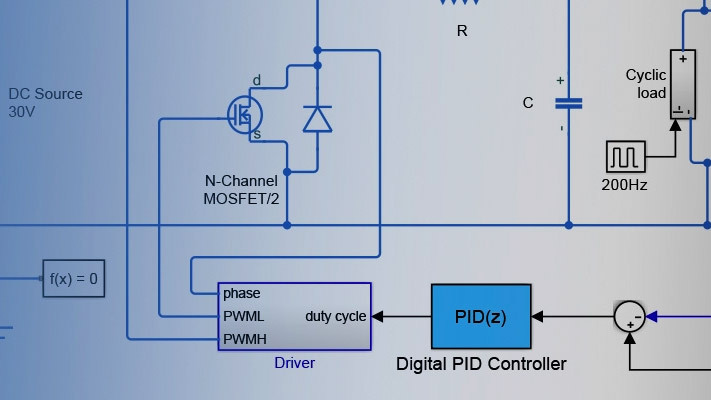 To adjust the duty cycle, the Control subsystem uses a PI-based control algorithm. The input voltage is considered constant throughout the simulation. A variable resistor provides the load for the system. The total simulation time (t) is 0.25 seconds. At t = 0.15 seconds, the load changes. Use a Permanent Magnet Synchronous Motor (PMSM) to amplify driver-applied force in a power-assisted automobile steering system. How the performance of a rotational energy scavenger can be explored using a simple representative model. Electrical energy is produced from an off-center mass attached to the shaft of a DC motor. The mass, geometry, motor and electrical parameters must be matched to the expected mechanical excitation. The generated electrical power is less than the extracted mechanical power primarily due to motor winding losses and viscous damping for the rotor. This example is based on Nunna, K. "Constructive interconnection and damping assignment passivity-based control with applications", Imperial College London (2014). The model here is simplified in that the DC-DC converter is omitted. The generation of a temperature profile based on switching and conduction losses in an insulated-gate bipolar transistor (IGBT). There are two buck converters. For one converter, the IGBT attaches to a Foster thermal model. For the other converter, the IGBT attaches to a Cauer thermal model. The parameters for the thermal models are tuned to give roughly equivalent results. At a simulation time of 50ms, the driving frequency changes from 40kHz to 20kHz, which increases the conduction losses and decreases the switching losses. The change in the losses results in a corresponding change in the temperature of the IGBT. A custom frequency-dependent transmission line model. The characteristic admittance and propagation function are first derived from the frequency-dependent resistance, reactance, and susceptance. The derived values are fitted using RF Toolbox™. The Universal Line Model (ULM)  is then implemented in Simscape™ based on the fitted parameters. 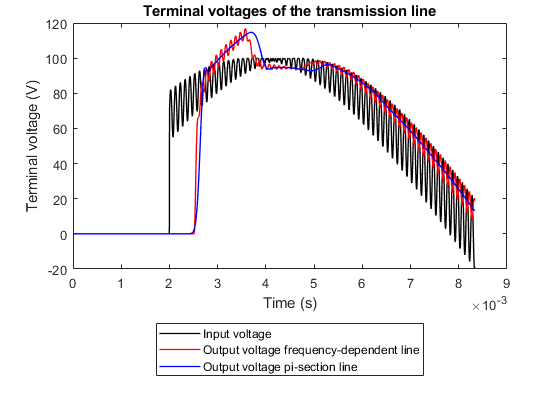 The results from the frequency-dependent transmission line model and the classic pi-section transmission line model are compared. A Peltier device working in cooling mode with a hot side temperature of 50 degC. 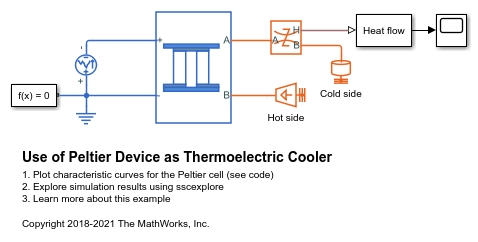 In cooling mode, the Coefficient of Performance (COP) of the Peltier cell is equal to the total heat transferred through the Thermoelectric cooler (TEC) divided by the electric input power, COP = Qc/Pin. 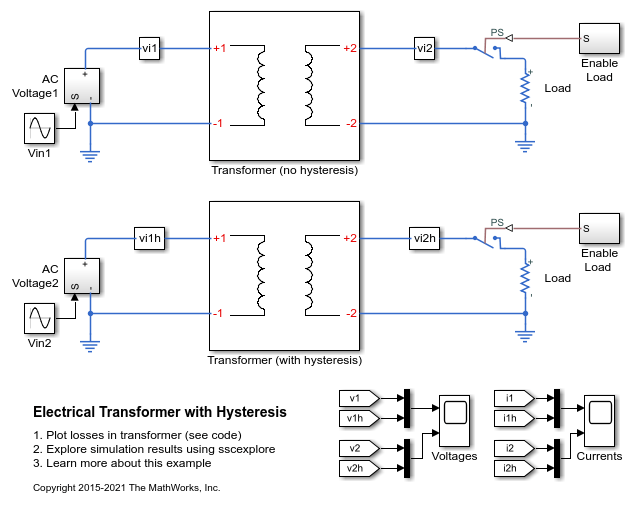 Model a custom transformer that exhibits hysteresis by using the Reluctance with Hysteresis block in a magnetic circuit. The transformer is rated for a 50W load and steps down from 120V to 12V rms. The magnetizing resistance Rm is modeled in the magnetic domain using an Eddy Loss block. 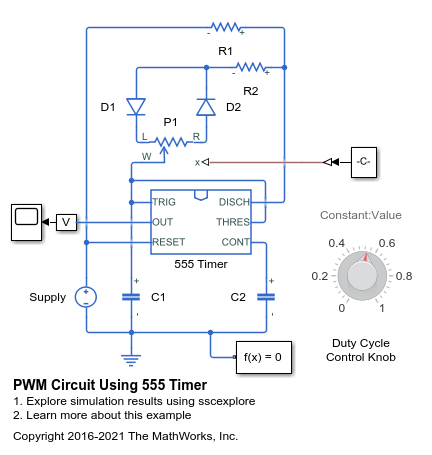 A pulse-width-modulated (PWM) output implemented using a 555 Timer in astable mode. The duty cycle is set by a potentiometer, P1. The potentiometer is controlled during run-time via Duty Cycle Control Knob. The scope shows the resultant output from the 555 Timer. To end the simulation, click on the Stop button.